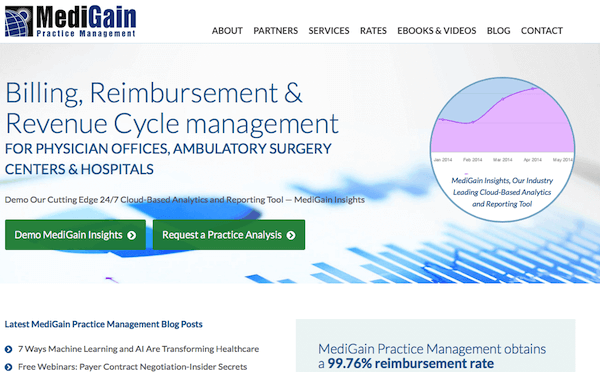 What do people see when they first land on your medical practice website? Is your home page filled with long blocks of text, tiny images or confusing navigation? Visual design can make or break the patient experience on your website, and that determines whether visitors will bounce or stick around to learn more. Your home page is your chance to put your best foot forward with a good first impression. That includes more than just your images. It also includes your messaging and user experience. 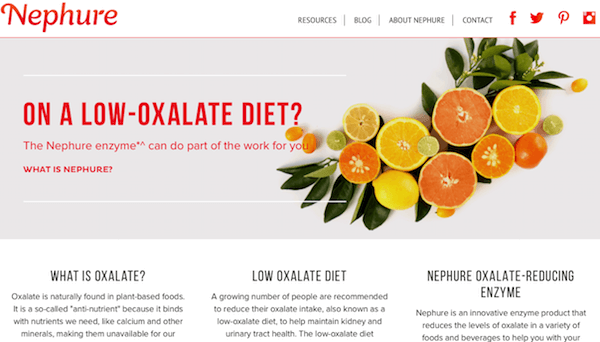 In this post, let’s take a look at 7 medical practice websites that are nailing it with brilliant visual designs. Th Medigain site immediately tells the visitor what the company does and who the audience is. The navigation is simple and straightforward, with two prominent calls to action. Each CTA button gives visitors an opportunity to take the next step, either by learning more about the product or conducting a practice analysis. Bottom Line: Straightforward messaging leaves no doubt about the product’s functional value for the intended audience. Nephure’s headline focuses on benefit to the reader. Even if you don’t know exactly what the product is yet, you know what it will do—get ride of your worries and let you enjoy life. Notice how this benefit isn’t related to a specific health outcome—it focuses on how the product can make you feel. The page supports that positive feeling with fresh, health-inspiring images that pop with color. Bottom Line: Headlines should make an emotional connection with readers. Tell them what’s in it for them. Why should they care? Astanza uses a super simple headline combined with video to drive home the benefit of their laser technology. The calls to action state exactly what visitors can expect when they click. Farther down the page, Astanza’s video gallery showcases the process and answers questions visitors might have. Bottom Line: Benefit-focused copy and video work together to keep people on the page and build trust. Kelsey-Seybold’s home page is simple and straight to the point. It features an immediate benefit (extended pediatric hours) and the image connects with viewers on an emotional level. Visitors can take two pathways: Patients or Employers. Each includes answers to specific questions and makes it easy to take action (find a location, make an appointment, learn about insurance). The page also features prominent patient testimonials to build trust. Bottom Line: Answer visitor questions and build trust by making it easy to find important information. 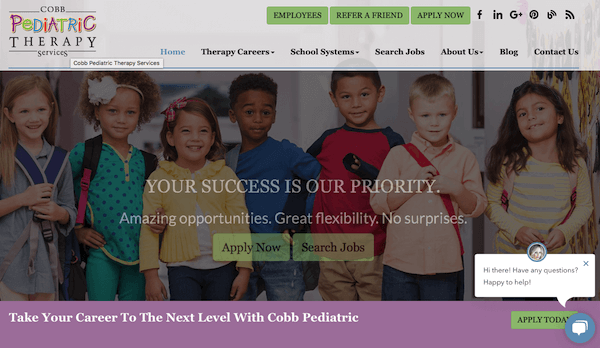 Cobb Pediatric Therapy does an excellent job of communicating a targeted message that includes an emotional appeal. The message rotates to pinpoint different personas, and simple calls to action appeal to different stages in the buyer’s journey. Bottom Line: Simple, strong calls to action support carefully crafted messaging designed to appeal to the target audience and motivate action. 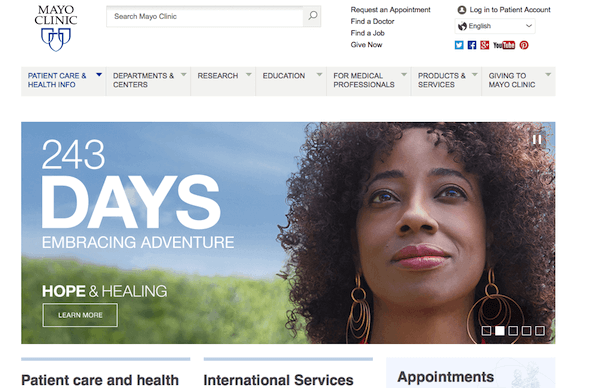 The Mayo Clinic’s home page focuses on patient experience, credibility, and information resources. With so many areas of expertise, it would be easy for this website to feel overwhelming, but their careful design shows visitors exactly where to find what they’re looking for. Navigation buttons with labels like “For Patients” and “For Medical Professionals” point visitors to the right resources, and calls to action encourage specific steps like donating, researching, or requesting an appointment. Bottom Line: This website does a good job of making a huge amount of information easily accessible with carefully worded navigation and links. Everyday Health shares health information and resources with visitors in an easy-to-digest, visual format. 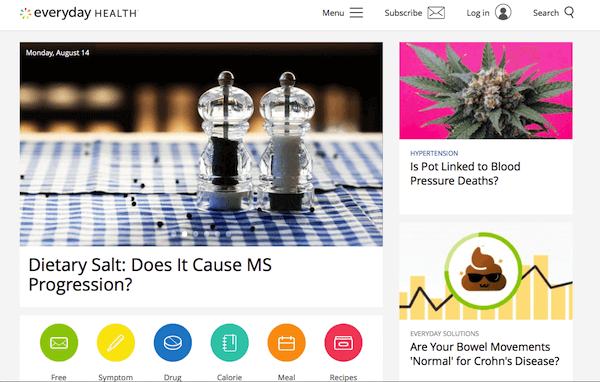 Clickable icons direct readers to the site’s various tools, and article headings group resources together by topic so visitors can find what they’re looking for quickly. Eye-catching images draw the viewer in and work with benefit-focused headings to arouse interest and keep people engaged. Bottom Line: This information-heavy site uses headings and images to help readers find what they want, hold their interest, and showcase the various resources available. The websites above don’t always get every detail perfect, and yours may not either. 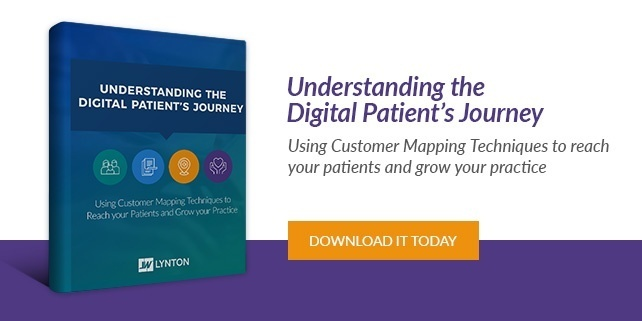 But they do understand the basic principles of medical website design: using images, messaging, and function to give patients a positive experience. 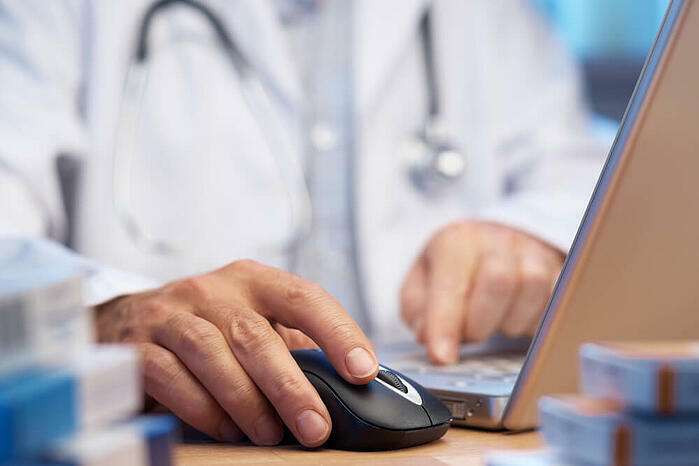 Do you need help strengthening patient engagement with your medical website? 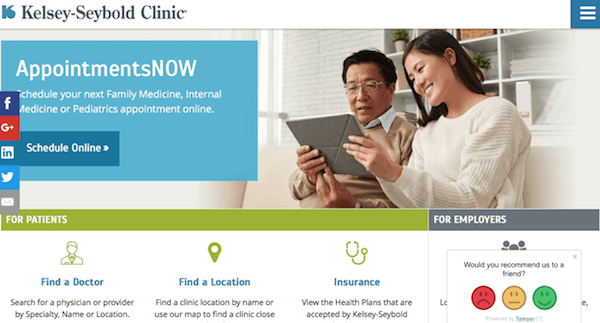 Talk to one of our healthcare marketing experts about how you can create a stellar site design!